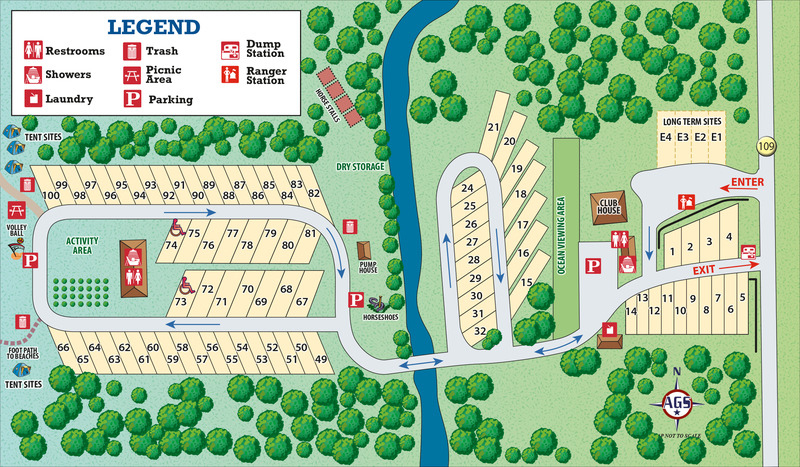 Ask fellow campers about "Thousand Trails - Oceana RV & Camping Resort" and nearby attractions. Pretty basic; not really in the "Resort" class, more along the lines of a campground. The FHU spots were short and crowded as well as not very private. Across the bridge the spots were well maintained but electric and water only. No cable and the 'over the air' TV is non existent because of the remote location. The Wifi in the clubhouse was painfully slow. Couldn't check email. We have a 'Flame Genie" firepit but we were told "no fires" unless it was a screened firepit according to county restrictions.. Other campgrounds in the area had no such restrictions. 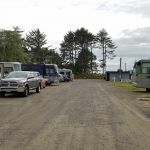 We camped at Thousand Trails - Oceana RV & Camping Resort in a Motorhome. People complain when a park isn't a resort. I don't mind the lived in look so this park was fine for me. Yes, older, worn down but serves the purpose for me. The few pull thrus don't have sewer so use dump at the entrance before you park or when you leave. Pull thru was spacious only because the two on either side weren't working so I had plenty of space. Wifi all but non existent so used our hotspot. We camped at Thousand Trails - Oceana RV & Camping Resort in a Travel Trailer. We enjoyed our stay at Oceana they have 2 areas. The front had some FHU the back section is over a bridge has water and electric 30 amp. The staff was super friendly and helpful. We stayed in the back it's shaped like an oval you have back-in sites on the inside of the oval which are rather small a class c or travel trailer would fit. The Road is tight trying to park your rig in the inside sites. We watched one gentleman trying to back his motor home in the center area back into his own vehicle. We saw large groups of families with small children come in. One kid was riding down the road and some how hit a pole and almost hit our neighbors new truck. Our poor neighbor had so many close calls with people almost hitting his truck trying to back their rigs in the sites across from him. The outer sites aren't very wide but do able. From the sites in the back section, you can hear the ocean. There's a path in the back of the park that takes you to the ocean. The path is narrow and there's tall grass and trees once you think you've made it to the beach and go over the hill you still have another 1000 feet to the water depending on the tide. People were catching Dungeness crab everyday. 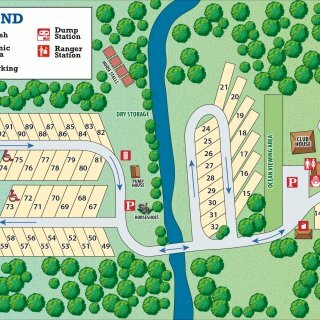 We camped at Thousand Trails - Oceana RV & Camping Resort in a Motorhome. Take a trip north on 101 to Olympic National Forest and stop by north beach, ruby beach, and the rain forest. This membership campground belonged to Leisure Time, bought out by Thousand Trails and now owned by the corporation that also owns Encore resorts. The campground is very basic, water and 30A electric only. There are a couple of nice tent sites that were well-used during the week we were here. The beach is a short 0.2 mile walk through the dune grasses, and once there you have miles of sand and waves waiting for you. The ocean didn't disappoint. However, the playground was cordoned off and in a total state of disrepair and neglect. Very sad, since it's the only real amenity left. We had a good time there nonetheless, and would return again. The nine "pull-thru" sites are very small, and very close together. Don't be thinking you'll get your big motor home or 5th wheel in that section. The sites across the bridge closer to the ocean have some longer ones available. Like the other membership campgrounds in this system, first-come, first served. We camped at Thousand Trails - Oceana RV & Camping Resort in a Fifth Wheel. Ocean Shores is a short drive to the south, and has everything you'd need at a slightly elevated price. Horseback riding on the beach access next to the Ocean Shores entrance is $20 per hour. Go north instead of south and you can have a superb fine-dining experience at the Ocean Crest Resort restaurant. Beautiful views from the bluff through the trees of the Pacific ocean. This was a pretty average TT campground, aided by a nice location. The immediate surroundings are pretty quiet, a few other hotels and RV resorts in Ocean City, and a few other sleepy beach towns up to the north. Ocean Shores is a decent town to the South, but still pretty sleepy even on a July weekend. Campground has a nice path out to the beach. Sites are a bit close but not too bad. Bathrooms were clean with plenty of showers, which is handy since there are a limited number of full hookup sites. A bit of open grass space, but not much around to do other than the beach for families with kids. We camped at Thousand Trails - Oceana RV & Camping Resort in a Travel Trailer. This park has only 3 sites with 50 amp and only about 10 with sewer and those are all 30 amp we stayed in a sit with sewer the site we stayed in was barely big enough to park our 36 foot class A into there are sites in the back section of the park that appeared more spacious but none had sewer the road barely in front of our rv was gravel or mostly dirt and dusty as about 80 other rv's had to stop there to dump. We camped at Thousand Trails - Oceana RV & Camping Resort in a Motorhome. Only few sites up front have full hookups--and only 30amp at that. They are short sites for a class A motorhome, but it works. Our site was not too tight, with enough space for our 3 slides and the car, but it would have been much tighter if we didn't have a small trailer for one neighbor. It isn't a resort by any stretch of the imagination, no amenities (well, they do provide a site picnic table , but too tight to really use it and I did spot horse shoes), but it is close to the beach; it's an ok park. No park WiFi, just a hot spot in the "clubhouse". The site 9 we were in was very level with a tiny patch of grass. Road was thin gravel/dirt, but where we drove it was free of potholes. I went to the larger rear area, and it is really quite attractive with all the grass. Few people here in mid-June, so lots of spaces and nearly everybody has an empty space between them and their neighbors. (Unlike the small front area with FHUs, with was full.) RVs are around the perimeter against the trees; a large open grass area in the middle is quite attractive. A path of a couple hundred yards leads to the beach. We stayed only one night on our way north. With Passport America, cost was $19 + $4 fee +tax. Stay at the rear W/E sites if you can hold off dumping till you leave; nicer area and I think the sites appear a bit wider. If you stay in the FHU sites in a class A, you will feel you are sticking out into the road--but there is plenty of width for others to get by. We camped at Thousand Trails - Oceana RV & Camping Resort in a Motorhome. Nothing unique about this park. More than half of it is out of commission due to a bridge being blocked. A short trail to ocean was nice. Very unremarkable for a TT park but no major faults. Concerning the tire spikes for coming in the wrong way: 3/4 of the width the spikes are not sticking up but one section of the device is still working and could get you. The "entrance" driveway brings you to a gate and attendant shack. We camped at Thousand Trails - Oceana RV & Camping Resort in a Fifth Wheel. I'm so angry with this park for one simple reason: they have tire puncture spikes installed on the exit road. Seriously!!! Sure, there are some small short stop signs visible from the road, but if you're arriving for the first time or after dark and don't see them, it will cost you dearly. I'm lucky I picked the right entrance coming in. Be very careful here! Otherwise this was a great park with walking trail access to a beach. The nicer sites are in the back, but those sites have no sewer access. At the time we stayed the playground was off limits, presumably for repair. If they removed the tire puncture spikes I would have given this park a 8. We camped at Thousand Trails - Oceana RV & Camping Resort in a Travel Trailer. The beach is very wide with flat hard sand and gentle waves. You can drive on it. It reminded me of Daytona Beach. This "resort" is a bit dated. Staff was friendly and helpful. Laundry is in a converted trailer. Club house is small but clean when we went there. WiFi and sewer were not available at our site, 52. Only a few 50A sites, many sites have no sewer. We choose to use our on board water since we use less than when using the park supply. Gravel roads, grass sites, key code required to get in after check in. 2 horseshoe pits, volleyball area. 100 yards or so on a narrow path to the beach. It this is TT idea of a resort the head office needs to get out more. 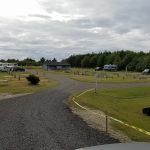 We camped at Thousand Trails - Oceana RV & Camping Resort in a Motorhome. Lots around the area if you are willing to drive. We were not impressed with the popular seafood restaurant in Ocean Shores. Most of the sites where Gravel/ Sand, and most had some chuck holes in them. Just needed a little adjustment to level. Spaces were kinda tight. Most Parks are nowadays. But we were there in the middle of the week so everybody was spread out. Quiet except for the Ocean. Had no problems getting my Dish up and running, which is good cause of no cable. No issues other than Wet misty mornings. I can live with That! We camped at Thousand Trails - Oceana RV & Camping Resort in a Fifth Wheel. This park is worn out. Sites are adequate in size but half of them are not roof mounted satellite friendly. Only a few sites with sewer. A few 50 amp sites for a fee. Water pressure OK. Verizon cell OK most of the time. Only one dump station, which has to be pumped out twice a week. A short walk on a narrow path to beach and a short drive into Ocean Shores. Only one IGA market and their prices reflect this. Management and staff very friendly. We camped at Thousand Trails - Oceana RV & Camping Resort in a Motorhome. Stayed in one of the yet-unleased "Lease" sites. Very nice 50 amp full hookups. Sites in the meadow have no sewer. Toilet/ showers are dated but clean. Staff were friendly to us. Easy walk to beach. Rate is Coast-to-Coast Premier for a 50 amp site. Would stay again. We camped at Thousand Trails - Oceana RV & Camping Resort in a Fifth Wheel. The rate reflects my TT status. There aren't any dump sites, except the two at the front, which is really only an issue because they don't offer any honey wagon services! It's older, the sites are tight but it's just a few hundred yards to the beach so it's do-able. The Wi-Fi at the lodge is hideously slow, so bring your own hotspot. The shower house is clean, I wouldn't choose this as a resort but it suits our needs. Bring your groceries, the store in town is overpriced and limited. We camped at Thousand Trails - Oceana RV & Camping Resort in a Fifth Wheel. Are you affiliated with Thousand Trails - Oceana RV & Camping Resort ?